During the month of November brave men across the globe attempt to cultivate impressive facial foliage in order to raise awareness of and money for men’s health issues. Dubbed ‘Movember’, this month is all about celebrating all things ‘man’ and from a fragrant perspective, it’s a perfect opportunity to cast a spotlight on some classic masculine fragrances. So, throughout the month of Movember, I shall be dedicating my weekly column to four important men in my life – four fragrances that are definitive entries within the world of masculine perfumery, also known as my ‘Movember Masculines’. This week we start with one of the most classic masculine fragrances of all time – Habit Rouge by Guerlain. When one thinks of the venerable house of Guerlain it is usually the brand’s feminine fragrances that stand out. After all, a trio of the house’s perfumes – L’Heure Bleue (1912), Mitsouko (1919) and Shalimar (1925) – are all not only considered as classics but are also three of the most revered and highly lauded compositions ever made. So it is only inevitable that Guerlain’s masculine arm is occasionally overlooked. But one quick glance highlights that there is more than a few manly classics lurking in the Guerlain wardrobe. 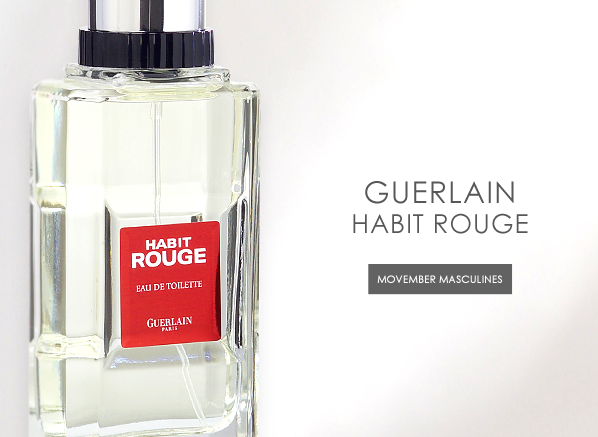 Perhaps one of the most obviously great masculine Guerlain has to offer is Habit Rouge. Created in 1965 by Jean-Paul Guerlain, Habit Rouge is inspired by the perfumer’s love of equestrian sport, taking it’s name from the red jacket worn by riders when off hunting. In terms of olfactory style, it very much sits within the Oriental genre, showcasing warm, spicy, woody and leather notes. Guerlain is well known for its Orientals and Habit Rouge is often compared to the supreme-Oriental Shalimar, with many seeing it as the flagship fragrance’s masculine counterpart and when smelling both, it’s not difficult to see why. Habit Rouge is bright and bubbly in the opening, with a range of lively citrus notes ranging from the tartness of lemon to the bitterness of orange. There’s something almost sherbet-esque about the mood of the citrus, and the sweetness too, that makes everything feel rather active right from the outset. Things do warm up pretty quickly and those bolder, spicier oriental notes jump into action within a jiffy. As one would expect from a Guerlain oriental, the star note is vanilla – an ingredient for which the house is famous. In Habit Rouge, the vanilla is expertly blended with the sweet, husky tones of leather, conjuring up images of ridging boots, crops and saddles. Iris adds a surprising amount of powder for a masculine and allows for the vanilla to diffuse like sweet dust swept from the cover of an old book. The Habit Rouge man is confident and nuanced. He feels at home riding solo or with comrades. He loves activities in the open air as much as he does pouring over books, sat in his favourite cracked leather chair. If he were to be growing a moustache for Movember, he would opt for a dapper handlebar, one that would not be out of place on the weathered face of a true equestrian. Habit Rouge is the most classic of my Movember Masculines, but that’s not to say that it is particularly old fashioned, in fact the truth is quite the opposite and this Guerlain is as good on Grandpa in his finery as it is when rocked by a young, leather jacket wielding man of today. It is utterly timeless, like most Guerlains, and is further proof that this perfume house, above any other, is the greatest to have ever existed. This entry was posted on Wednesday, November 6th, 2013 at 10:42 am and is filed under Candy Perfume Boy, Fragrance, Guest bloggers, Men, Tried & Tested. You can follow any responses to this entry through the RSS 2.0 feed. You can skip to the end and leave a response. Pinging is currently not allowed.